Philips launches Fidelio wireless hi-fi range | What Hi-Fi? We spent this morning with Philips, learning all about its new Fidelio wireless speaker range. There are four wireless streaming speaker systems, and two wireless hi-fi streaming boxes coming out between now and September. The best Philips audio products will now be sold under the Fidelio sub-brand, but that won't be limited to just docks. “Our aim is to build a premium, connected audio brand with superior sound, iconic design and simplicity,” says Philips. It’s targeting high-end companies such as B&W, Bose and Bang & Olufsen. "We are aiming these products at customers who are genuinely passionate about sound." Three of the new wireless speakers use a dedicated, custom-built AirStudio app that can stream music from either Apple iOS or Android devices, such as tablets and smartphones. Mac or PC owners can stream music using the bundled Philips Media Manager software. The AirStudio app is available as a free download from the Apple App Store or Google Play. It also gives access to internet radio stations and Napster, and although Philips couldn’t confirm anything today, the firm says it is “in discussions’ with other music streaming services. Was that a Spotify logo we spotted on the presentation by any chance? As for the products themselves, the line-up consists of: Philips Fidelio AW9000 (£500, above and below), AW5000 (£300) and AW3000 (£200). All three will be available from John Lewis stores this month and have built-in Class D digital amps. Up to five wireless speakers can be connected together to create a simple multiroom system. Each of the two more affordable models has a diamond-shaped cabinet designed for “versatile, easy room placement”. The tweeters fire outwards at an angle for “better high frequency dispersion”, says Philips. First up is the smallest unit, the Fidelio AW3000 (below), a compact two-way stereo speaker with a soft-dome tweeter and compact woofer. Its bigger brother, the AW5000, features two soft-dome tweeters and a pair of 4.25in woofers in a bass-reflex enclosure to provide a sufficiently powerful sound in larger rooms. At the top of the range is the Fidelio AW9000, a pair of separate stereo speakers fitted with six transducers. One contains the digital amp and is slaved to the other. Digital and analogue inputs allow connection of several source components. Also new are a pair of wireless hi-fi streamers, the Fidelio AW1000 (£150) and AW2000 (£250, below). They’ll be available in August/September. The cheaper model is simply a non-amplified streaming box which connects to your existing hi-fi and speakers, while the pricier unit has a built-in 2x50W digital amp, so you just need to add speakers. Philips has also unveiled the replacement for its DS9000 iPod/iPhone dock, the £500 Fidelio Primo DS9100W. The main improvements are the addition of AirPlay, a new digital active crossover, biamping of the speakers and redesigned bass ports. It will be available from August. 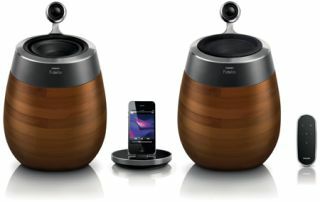 In addition, there’s a limited special edition version of the SoundSphere AirPlay speakers with a wooden finish. Just 500 pairs will be made globally and only 50 will be available in the UK – sold exclusively through John Lewis. Finally comes a new addition to the Philips headphone range, in the form of the £160 Fidelio M1 headphones. They’re designed for outdoor use, are smaller and lighter than the existing L1 model, and feature an on-ear and vented design. Technical highlights include the same 4cm neodymium drivers found in the L1, a new lightweight voice coil, memory foam for the earpads and a leather-covered headband. They go on sale in June.